Since ATI was founded in 1986, our mission has been to create and disseminate technology to promote learning. We have achieved many milestones in our ongoing efforts to provide cutting-edge curriculum, assessment, and reporting tools to promote learning from birth through high school. 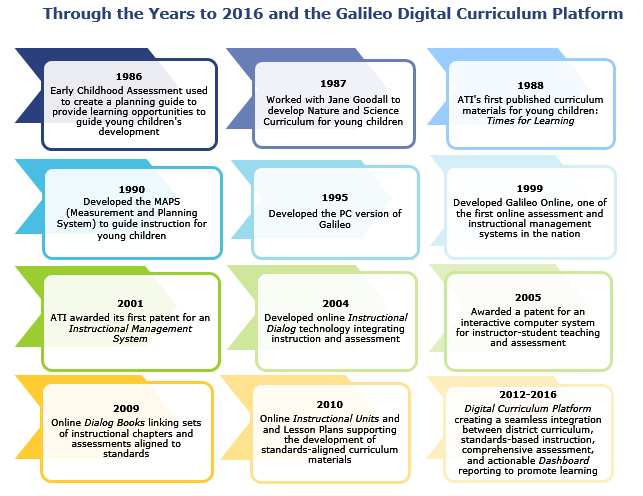 We’re excited to highlight some of these milestone, but to learn more read our new paper, A Brief History of Galileo Digital Curriculum Technology. ATI initial work on the development of technology making curriculum available online and integrating curriculum with assessment began just prior to the 21st century. Our early work focused on transforming educational management tasks typically implemented offline to an online environment. Our first patent for an instructional management system integrating curriculum with assessment was filed in 1998 and granted in 1999. Shortly after this initial work, we began an initiative to implement teacher facilitated online instruction and assessment involving multimedia assessment and instructional content. As a result of this work, a second patent involving multimedia instruction offered online using ATI’s Storyteller technology was granted in 2005. Following the initial work with multimedia content, ATI introduced the concept of an online Instructional Dialog. Dialogs enabled teachers to create their own online lessons and assignments. In addition, Dialogs provided prebuilt multimedia instructional resources. Shortly after the introduction of Dialogs, ATI introduced Dialog Books. The Dialog Book offered a structure within which to organize instructional content. Each chapter in a book began with chapter objectives based on standards in use by the district. Assessments linked to each chapter provided evidence on what was learned from the book. Instructional Units and lesson plans were also added to the system. The concept of a digital curriculum platform emerged from the early lesson plans and Instructional Units available in Galileo. It also had common features with Dialog Books. Like the books, the Galileo Digital Curriculum Platform provided a structure within which to organize instruction. The platform had the additional advantage of being able to house district curriculums online. The availability of online curriculums supported real-time curriculum delivery of instructional content. The fact that the curriculum was online and linked directly to assessment information opened the way for the creation of dynamic curriculums that could be continuously improved based on consideration of assessment evidence. As technology availability and capability have increased, many new features have been added to the platform. This is to be expected. The platform is designed to change. In our view, that is a requirement of 21st century education and educational technology. 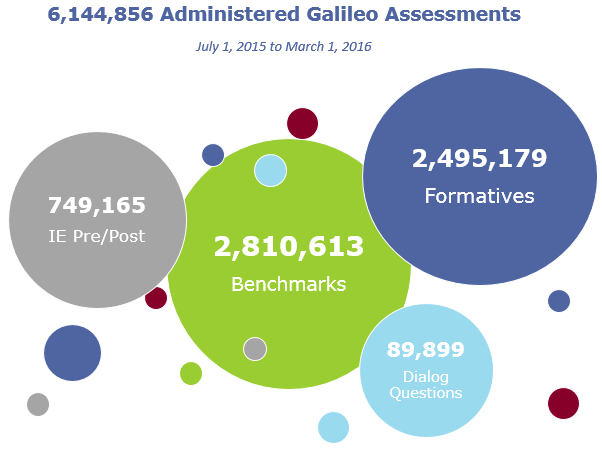 Learn more about Galileo technology by scheduling a Galileo Overview.